Click here for more styles and a printable PDF brochure. 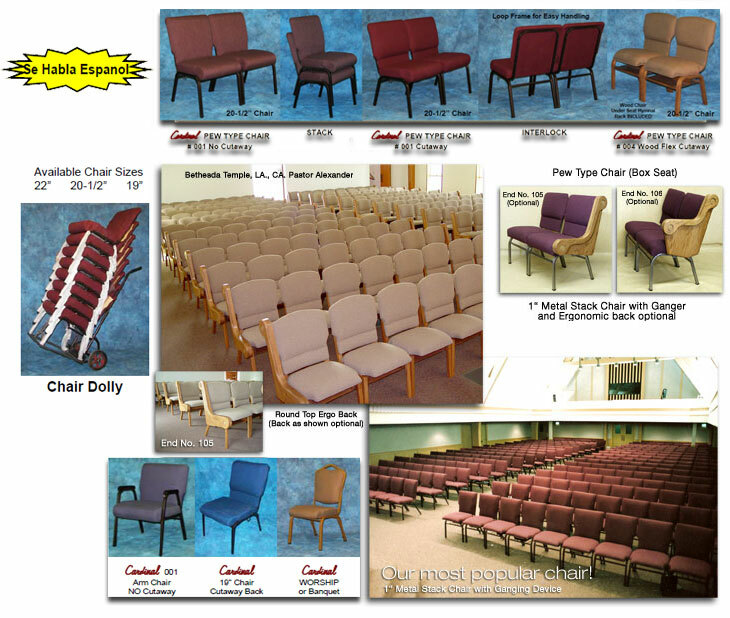 We Market a comprehensive array of MODERN Pew Type Church Chairs, Stackable & Gangable. From our ALL WOOD Frame to our 1 Inch Metal Stack Chair Frames. Our SEATS and BACKS come in various shapes designed to satisfy your taste. Our WOOD Chair is Ply Bent for Strength, Attractive Esthetic Appearance and Comfort. Our Metal Stack Frames are HEAVY DUTY powdercoated steel. Our meticulous bending process gives a strong uniform wall thickness throughout the bend to give you a long lasting product. Our CHAIR Seats and BACKS are made with high density, California Fire Code TB 117 Compliant Polyurethanes. These polyurethane's are "MEMORY FOAM", chemically compounded to "remember" and return to their original shape. Our Backs and Seats are pressed in uniform upholstery dies for dependable uniformity. Our Seat and Back foundations are ply formed wood—not plastic. They are designed to far out-live plastic, which can become brittle. Our Seats and Backs can be re-upholstered in later years. Our Metal Frames come with a limited 10 year warranty and our Upholstered parts have a limited warranty of 5 years. Warranties are Porated, Vandalism, Abuse, Shipping are Excluded. Our entire Chair Line is available with any of our Pew End Designs, which can be attached to the end chair in each row.